Last week I drove a bag of clothes to Goodwill. Then I went into their store. I do live a wild life, don’t I? I came back out a half hour later with an All Clad 9” fry pan in perfect condition (they cost $80 new) and an antique rocking chair. The total was – wait for it - $10. I learned this years ago at an art show of American impressionist art. The mid-late 1800’s were a time of huge social upheaval; one of the harsh new realities was that women were leaving their homes by the millions to work for exploitive wages in large and dangerous factories. This made the super-rich manufacturing oligarchs uncomfortable – they didn’t like to look at the thin, exhausted, bedraggled women who were pouring into their factories and mills, often leaving their children home alone. It made the industrialists feel poorly about their monstrous wealth so many of them turned to collecting art in their free time. That way they could show off their wealth to other wealthy people. They especially enjoyed lovely relaxing paintings of lovely relaxed women doing lovely relaxing things. Canoeing, having picnics, holding babies. Reading to each other or combing their hair; most of these activities are done in beautiful light which those Impressionist painters really knew how to handle. Len was busy in our garage when I got home. He picked up the chair, turned it over, showed me where one of the supporting pieces was split the long grain of the wood. However, within five minutes he casually glued it back together and put a clamp on it. There were also sharp things sticking out of one side of the seat. I already knew those were most likely upholstery tacks with the heads off so I ordered (on-line) upholstery tacks for a mere $10. And then I looked at a variety of YouTube videos about how to freshen and clean antique chairs. I don’t want to strip and redo the whole thing. I just want it to look nicer and less beat-up (this is how I approach make-up, also). The recommended chemical only cost $13 at Ace. So I now have a lovely little rocker that only cost $28. Whatever. The next conundrum was where I was going to put it. Long story short, we have a dining room table with 6 chairs and a kitchen table with 4 chairs, plus porch chairs, living room furniture, and 4 folding chairs in the basement. We could easily seat 25 people, if we wanted to. I’ve gone to smaller churches. 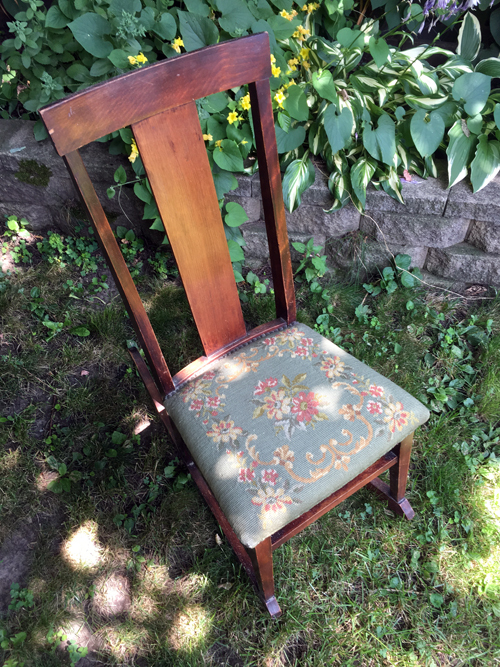 I took three (unrelated to the above sets) 1920’s Duncan Phyfe chairs (rescued from stuff set out for bulk-pick-up in our old neighborhood) to St Vincent’s to donate them. The seats of these chairs fit inside a little ledge inside the chair frame, then one screws the seats from the bottom. The last time I recovered the seats I didn’t screw them in because I am efficient like that. If it isn’t going to fall out, why find the power drill and the 50’ extension cord somewhere in the basement or garage? The heft of the fabric wedged the seats in, plus we don’t bounce on our chairs. Here’s the thing. I have been donating to and buying from St. Vincent since we moved here to Waukesha. I know they do good work in the community. When we moved here their driveway up to the donations door was just that. A clear driveway. Now it’s lined with giant boxes on pallets and they are all four feet deep in bedraggled donations. This is what’s outside. (Don’t they get bugs and mold?) They also have their huge high-ceilinged storage room in which there are tall, deep racks and shelves of donated things. Plus the store itself, filled with things. What is happening here? Did my store change their policy? Very probably; maybe they are now a center for more sorting of donations from more places, I don’t know. But there was SO MUCH STUFF! So much that in fact, the warehouse supervisor has laid down rules that workers must to turn away items that in the past they would have accepted. This overflowing happened in two years? That moment felt huge, overwhelming, and dystopian. Friends, we are drowning in too much stuff here. We buying and obtaining, hauling things to our houses for a season or two, then decluttering the detritus back out when we are tired of it. Did you know you can watch videos (hundreds of them) on YouTube of people cleaning their houses? They declutter for a couple days, then put their camera feed on high-speed and post it. Occasionally I watch them when I have insomnia because they are both fascinating and boring. Those guilty-feeling Gilded Age oligarchs liked to look at nice ladies spending serene afternoons with their friends and children. So what are the images diverting us from the harsh truths of our time? Are “minimalism” and “Marie Kondo” and “decluttering” about finding a path to balance, creativity and justice? Or is it just keeping us busy so that we don’t fight for anything beyond white walls and cleared surfaces? I don’t know. Do you? Maybe it's just that there are so many baby-boomers reaching an age where we know/fear that the day of reckoning is coming -- we will choose to, or be forced to, move to smaller quarters and are preparing for that day. Some of us may be thinking even farther ahead and envisioning our survivors having to sort through piles of "stuff" and wanting to save them that task. Cleaning out my parents house (they NEVER got rid of ANYTHING) was a monumental task that I would not wish on anyone. My house is not that bad, but I constantly think about it and have made some limited progress on tackling the task. I have donated kitchen stuff to the children of several friends who were setting up their first apartments (including some All-Clad stuff and that pan of yours originally cost more than $80), donated clothing to a women's shelter, donated jewelry to an organization that sells it to support providing free legal services to children, donated huge amounts of craft supplies to a community art center, and still there is so much stuff. I have mostly put a moratorium on acquiring more stuff other than some new fine art to hang on the walls and replace the cheap posters. I justify the art acquisitions by considering myself a "patron" of the arts. Joyce, I completely agree with you. We reduced our possessions (especially the large ones) by more than a half when we moved from the house where we raised the kids to here. And I still declutter and give away things almost weekly. I guess what makes me sad and questioning is just how much we all have, that getting rid of it is ongoing and so much work and when we get to the donation site - there are mountains of things already there. Share with us! WHERE did you donate jewelry? I have So Much Jewelry. Nice work-appropriate necklaces from my adult life, a box of my mother's rhinestone church sets, a few things that once belonged to my grandmothers. I would love to know a place to donate these things where they can do some good. I have to stop reading your writing immediately after posting. It’s fun reading the comments. Groaning. I have plenty of cleaning out to do too - MK saw my attic storage space. I do love your chair - the seat is so pretty. Keep a look out for a bread machine in your goodwill wanderings. A good one for cheap. Be careful what you wish for - I see bread machines almost every time I go to Goodwill!